Like many others who visit the Capitol for the first time, I experienced love at first sight when I entered the Rotunda. As I stood in place just staring up for what seemed like hours, I spotted the Apotheosis. Prior to his work at the Capitol, Brumidi painted Vatican and Roman palaces while training in Rome. This work no doubt is what enabled him to paint frescoes and murals throughout the Capitol over 25 years. The Apotheosis of Washington is Brumidi’s most ambitious work and took approximately 11 months to complete after the end of the Civil War. Some of the figures surrounding Washington in the fresco were inspired by classical/Renaissance images, mainly those of the great Raphael, and others of the others depict important men in American history. As I spend more time touring the Capitol, I suspect I will become something of a Brumidi expert, and I invite you to keep reading for updates! See the Architect of the Capitol’s website for more information about this fresco. A few times a year, I work with a non-profit organization—Live It Learn It—to give Capitol tours to 5th graders from some of DC’s most under-served public schools. Those are days I always look forward to for the obvious reason that the kids are not only bright and respectful, but they’re totally adorable. Another entertaining aspect of these tours is trying to anticipate what questions the kids will ask me because, as anyone who has spent time with 5th graders knows, they can ask a lot of very specific questions about very random things. Without fail I will get a new question during each tour, usually about an obscure part of a painting or sculpture in the Capitol somewhere and, of course, it’s always something I know nothing about. So, after each tour, I find myself back at my desk, looking up the answers to these many queries. This piece of sculpture sits above where one enters Statuary Hall from the Rotunda. 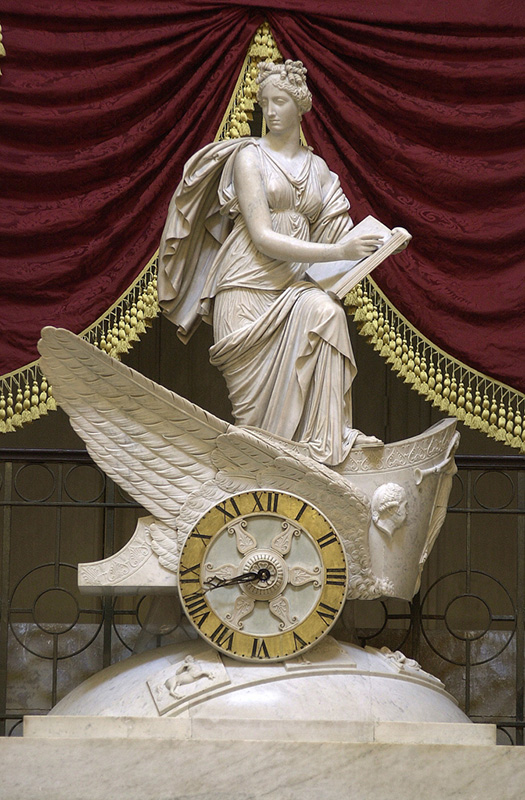 It is a marble sculpture of Clio, the muse of History, standing in a winged chariot, which sits atop a marble globe that has the signs of the Zodiac engraved on it, with the face of the clock as the chariot’s wheel. In her hand, Clio is holding a book within which, it is said, she was recording the unfolding events in the House. On the other hand, the chariot depicts the passage of time. The sculpture of Clio in the chariot was done in 1819, by Carlo Franzoni, thereby making it one of the oldest works in the Capitol. The clock was installed in 1837 and was done by Simon Willard. And no, the clock doesn’t work anymore. 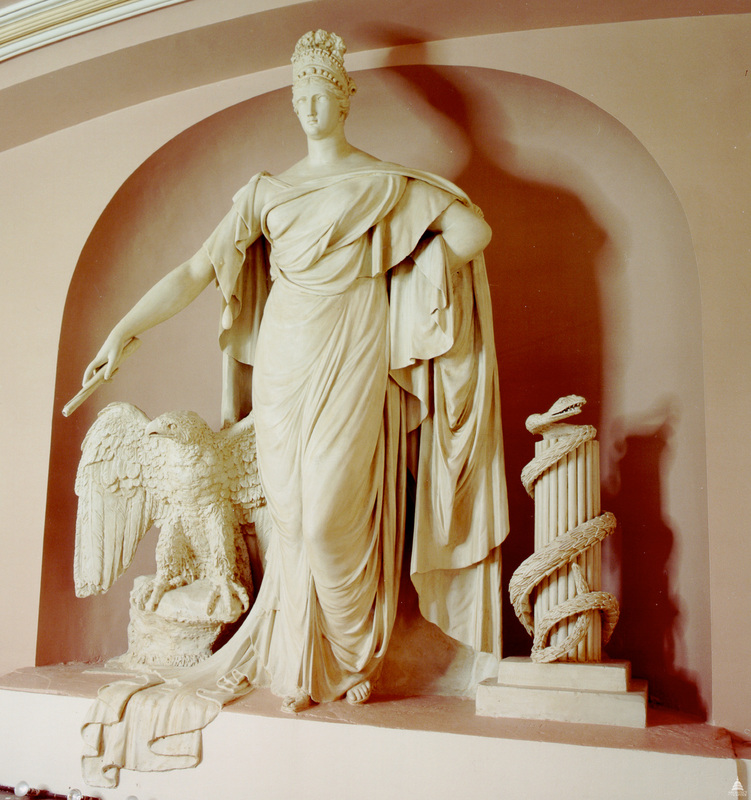 This plaster sculpture depicts Liberty—as with Freedom, Liberty is personified by a female figure—with an American bald eagle to her right and a serpent coiled around part of a column to her left. The serpent is apparently a sign of wisdom, although that’s not usually what I think of when I encounter a snake. In her outstretched hand, Liberty holds a rolled up copy of the Constitution. The piece is above where the Speaker’s desk used to be when the House met in Statuary Hall, and is now above the area where members of the House and others walk through to enter the current House chamber. 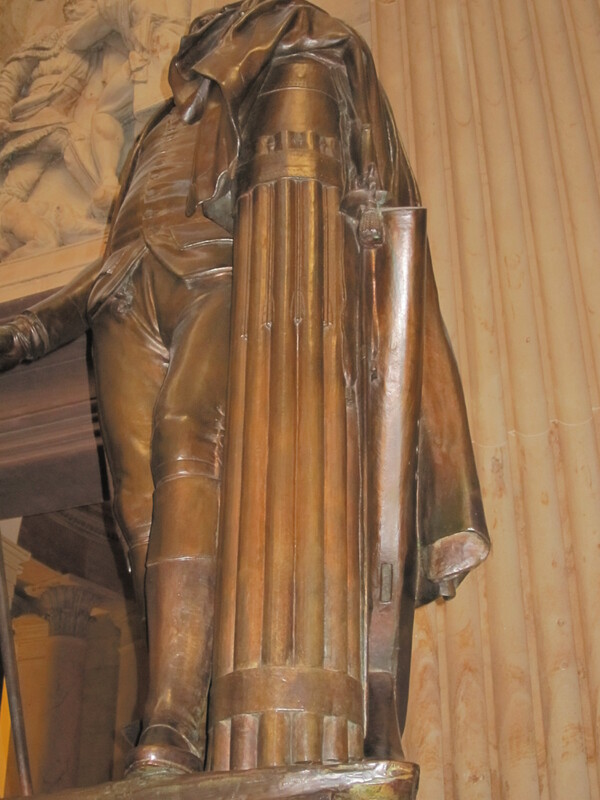 The sculpture was done by an artist named Enrico Causici and placed in the Old House Chamber between 1817 and 1819, also making it one of the oldest pieces in the Capitol. With the celebration of Presidents Day on Monday, it is very easy for us to forget that today, February 22nd, is actually George Washington’s birthday. In honor of Washington’s birthday today, we decided to do a little digging into the issues that arose over where to bury our first president and where and what kind of monument to build to him, both of which were discussed as early as 1783, well before Washington even became the first President of the United States. From the initial idea for a monument in 1783 to the later idea for his body to be interred in a crypt at the U.S. Capitol to the finally agreed upon design for the Washington Monument in 1836, the issue of how to best commemorate the contributions of George Washington was a long and ever-evolving process that spanned the greater part of the 19th century. We hope you enjoy our foray into the complexities of memorializing our first and, perhaps, greatest president. The original idea for a monument—an equestrian statue—to Washington was approved by the Continental Congress in 1783, and it seems he himself was involved in these early discussions about how and where to commemorate his life and contributions (though more because he wanted to help in continuing to unify the new nation and government after he passed on, rather than for any narcissistic reasons). It would appear that he helped Peter L’Enfant choose the desired location in DC for that originally planned statue. Additionally, it appeared Washington had been discussing the issue of interring his body in the U.S. Capitol with architect William Thornton. In 1793, Washington approved Thornton’s plan for the building, which “included a ground-floor tomb for his own remains. The crypt would occupy the exact center of the capital, where the city’s four quadrants met, and in the rotunda above it Thornton indicated a new location for the equestrian statue.” While housing beloved figures in national tombs was far from a new idea, “The double monument of equestrian statue and tomb would have cemented the importance of the Capitol building as the unrivaled symbolic center of the nation.” Washington, however, despite privately discussing and in some cases approving such plans, knew he could not publicly support the idea of a tomb in the Capitol, as he felt it would be antithetical to the Federalist and republican spirit in which he had helped to found the country. Accordingly, he ensured that his will indicated that he was to be buried at his beloved home of Mount Vernon, a move many close to him believed was his true desire as it were. Washington’s unexpected death in 1799 would only further complicate matters. With Washington’s passing, as per his will, he was laid to rest at his family home at Mount Vernon; however, with the Congress moving into their new home in the capital city in early 1800, the debate over Washington’s final resting place became contentious within the walls of the new Capitol. As if the issue was not enough of a mess already, after Congress had agreed to ask Martha Washington for her permission to move her husband’s body back to the Capitol for final burial in the still-unfinished Crypt, the Federalists in Congress then decided it would be an even better idea to have a larger, ancient Egyptian-style mausoleum separate from the Capitol to forever entomb and enshrine Washington’s remains, having already commissioned a design for it from architect Benjamin Latrobe. Latrobe’s design and a subsequent enhancement of it by George Dance, a prominent British architect, would have this mausoleum standing at 150 feet tall, which would have been larger than the Capitol building at that time, something that set off Democratic-Republicans in Congress who believed it was apotheosizing him in a way that would have made Washington himself uncomfortable. 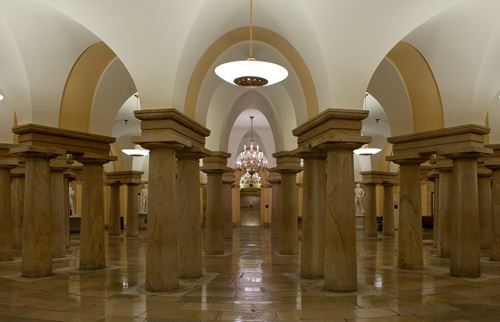 When a vote on the mausoleum project finally came before the Congress, the vote went along party lines—Federalists for and Democratic-Republicans against—but since the Senate refused to go along with the House’s version of the bill, the matter finally died. While the efforts to enshrine George Washington’s remains in a mausoleum that harkened back to the days of ancient Egyptian or Roman deities fizzled out, two questions remained: should Washington’s remains be moved to the Capitol Crypt (which does exist and is located directly below the Rotunda) or any other site, and what kind of memorial or monument should be built to honor the man who served as our first and most revered President? The first question would be answered pretty easily in February 1832, “on the eve of his centennial birthday, the Twenty-second Congress made a last-ditch effort to redeem the promise made to the hero’s wife thirty-two years earlier. The internment, however, never took place.” Washington’s great nephew, John Augustine Washington, was now the proprietor of Mount Vernon and refused to allow the body to be moved from the family home, and Congress deferred to him on the matter. The second question proved less easy to answer, simply because it took decades for a monument to Washington to finally come into being. 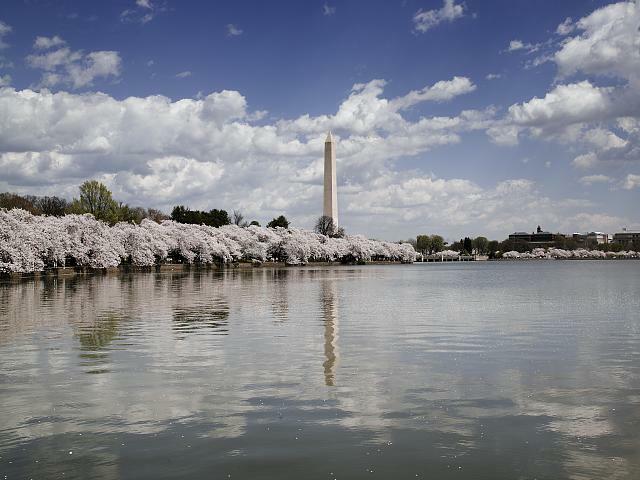 After a few decades without much talk of it, a movement began in the 1830s among a group of wealthy, private citizens to raise funds to build a national monument to George Washington to be designed by architect Robert Mills. Although, based on his initial design, the monument was to originally include some grander aspects, it was later decided that just a plain, Egyptian-style obelisk would suffice as a monument to the great man, though many would feel it was too impersonal for the Father of our Country. By 1848, the group had raised $87,000, which persuaded Congress to donate public land for the endeavor; while it was originally meant to be built at another point along the west end of the Mall, the managers of the project felt the foundation of the higher ground it stands on today would be more suitable for this undertaking. On July 4, 1848, the ceremonial first cornerstone was placed before a large crowd with much fanfare. A chronic lack of funds as well as the Civil War slowed the construction severely over the next several decades and the monument would not be finished and dedicated until February 21, 1885 and would not be opened to the public until October 9, 1888. 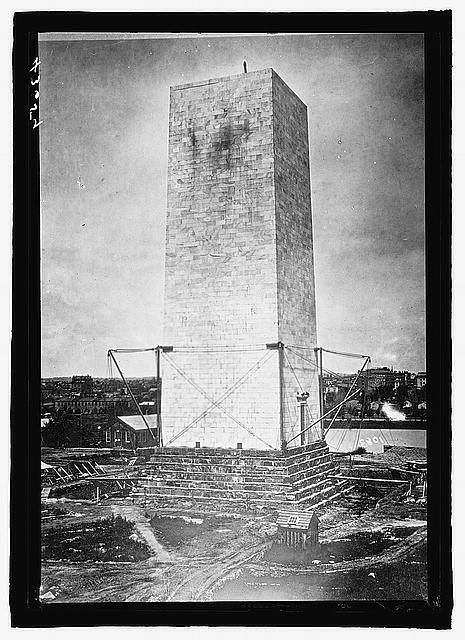 In the end, the Washington Monument would weigh in at 81,120 tons and at a height of 555 feet and 5 1/8 inches, and while it was hardly the show of restraint that many had wanted (and some would likely argue that Washington himself would also have wanted more restraint in designing any such monument or memorial to him), it was a far cry from some of the earlier iconoclasms that were suggested. Even though Washington’s birthday is no longer a separate holiday, we should all be sure to remember that on this day in 1732 our first and, to most, our greatest American President was born, not knowing at that point that he would soon help to forever change the course of world history. So, please join me in wishing a very happy 280th birthday to President George Washington…let us never forget your actual birthday again. Kirk Savage, Monument Wars: Washington, DC, the National Mall, and the Transformation of the Memorial Landscape, (University of California Press, 2005). Rubil Morales-Vazquez, “Redeeming a Sacred Pledge: The Plans to Bury George Washington in the Nation’s Capital,” in Establishing Congress: The Removal to Washington, D.C. and the Election of 1800, Kenneth R. Bowling and Donald R. Kennon, eds. (Ohio University Press, 2005), pp. 148-189. A few weeks ago, I had occasion to give an outdoor walking tour of the Capitol to a group of 2nd graders from a local school, and they submitted questions ahead of time that they were hoping to get answers to that morning (which, by the way, I thought was both adorable and really smart). As you can imagine, the questions ran quite a gamut—from why was the Capitol built to does anyone live in the Capitol—so I certainly enjoyed going about compiling all of the answers and I even found myself doing some serious research for a couple of them. There was one question, however, that was far more complicated to answer than one might imagine. Who designed the Capitol? Seems like an easy question that should have an easy answer, right? Wrong. There were so many architects that oversaw the design and building on the Capitol during all of its various phases of construction and extensions and repairs until its completion in its present form in December 1863 that it is hard to keep track of them all. Yet no matter how many architects are on that list, one will always stand out: the first one. Dr. William Thornton was and will forever be known for having been the first Architect of the Capitol, despite having no actual training as an architect. Thornton was born in the British West Indies in 1759 and was sent to England at the age of 5 by his parents for his education, receiving his medical degree from the University of Aberdeen in Scotland in 1784. 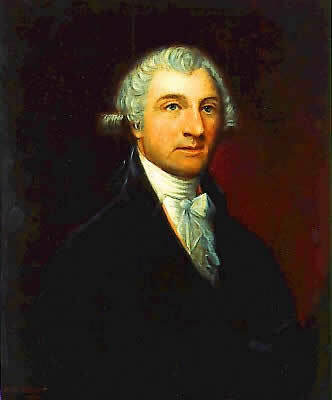 Thornton would move to the United States—Philadelphia, to be specific—in 1786 and subsequently became an American citizen the following year. So how did a medical doctor and newly naturalized citizen with no architectural training come to be chosen to be the first to design and oversee construction of the United States Capitol? The answer is, again, not so simple. In 1790, the Congress passed the Residence Act, which put an end to the argument over where the new government would reside, with an area along the Potomac River settled upon as the designated site of the new capital city (the exact location would be chosen by George Washington in 1791). The Congress, the President, the Supreme Court and other federal government buildings would all be calling DC their home in ten years time, which was when, according to the Residence Act, that those buildings needed to be completed. Washington then created a three-man commission to oversee the construction of the whole city and the federal buildings that would house the various branches of government. After Pierre L’Enfant, the man who designed DC, was dismissed by the commission in 1792 for refusing to make any of his plans known to them ahead of time (he said they were all in his head and he didn’t feel he had to make any drawings available to them, nor did he believe—wrongly, as it were—that he was even subject to their control or approval), they opened up a public design competition for the Capitol in March 1792, with the winner to get $500 and a city plot. Despite 17 entries, the commission was not pleased with any of them, and with time ticking away, they wondered if they would find a plan they could agree upon. Then, in October 1792, months after the competition had officially ended, they received a letter from Dr. Thornton asking if he could be allowed to submit his plan for the Capitol, and since the commission had yet to make any decision they permitted him to do so. When Thornton finally submitted his plan for consideration in January 1793, it was received with a great deal of enthusiasm from a number of people, including Thomas Jefferson and George Washington. Jefferson said to the commissioners about Thornton’s plan, according to Thornton’s own papers (cited below), that it had “so captivated the eyes and judgment of all as to leave no doubt you will prefer it.” So with the consent of the commissioners and with the formal approval by George Washington given on April 2, 1793, Thornton’s plan for the U.S. Capitol was put into motion. Though his design was a take on classical European architecture, with the two wings of the House of Representatives and Senate being joined by the central piece with a low dome, Thornton’s design would be housing a free and democratic legislative body, unlike most throughout Europe at that time. The Capitol has been altered considerably since Thornton’s original design was submitted and constructed, as has the role of the Architect of the Capitol; Dr. Thornton’s role then was simply to design and oversee the original construction of the Capitol under the supervision of the commission and the President. During Thornton’s tenure as the Architect of the Capitol, only the original north wing of the Capitol was constructed, although much of the original structure, with some modifications, is based upon Thornton’s design. This is merely a very brief and simplified answer to the question of who designed and built the Capitol. Essentially, it deals only with the issue of design rather than construction, which involved a great deal of enslaved labor–and that’s a whole other story for another time. No matter how one goes about answering the question of who designed the Capitol, however, there is only one name that can be used to start that explanation: Dr. William Thornton. Not such a bad question for a bunch of 8 year olds, was it? As always, let us know if you have any questions about the Capitol that you’d like answered and we’ll do our best to accommodate you. “Papers of William Thornton: Volume One, 1781-1802.” Edited by C.M. Harris. University Press of Virginia, 1995. Perched on the hill leading down to the Mall from the Senate (north) wing of the Capitol is a small, red-brick structure. Most visitors to the Capitol complex walk straight past it, some oblivious to its presence, others curious but too focused on their next appointment to take the time to discover what’s inside. What is inside is a beautiful oasis, a place for those weary from the climb up the hill—or weary of Washington in general—to rest their feet, sip water fresh from the fountain, and take in some of the best views of the Capitol. 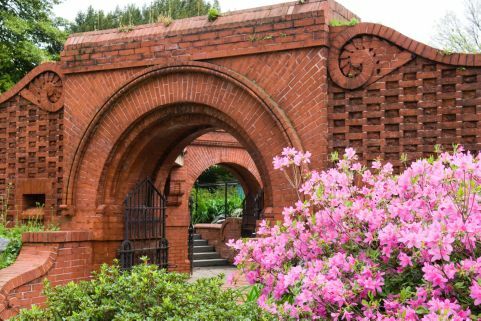 It is known as the “Summerhouse,” a hexagonal structure with three arched doorways beckoning visitors from all directions. Inside, stone benches with armrests line the walls, providing ample seating for up to 22 guests. The benches are covered and protected from the elements, while the roof is open in the middle to allow for warm sunshine and soft breezes to play through the idyllic setting. 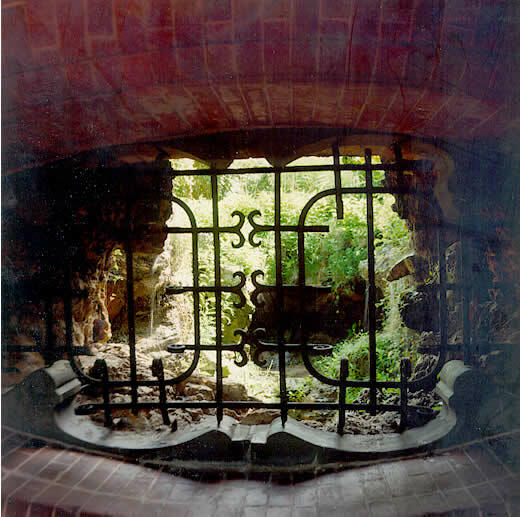 Visible through a window is a grotto, providing visitors the soothing image of a small stream of water tumbling and gurgling through foliage and over stones. 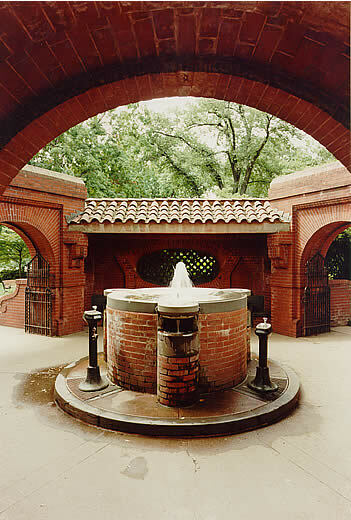 Located in the center of the Summerhouse is a drinking fountain. Originally, water was piped in from a spring, with six metal cups or ladles hooked around the outside as vessels for visitors. The original design has been updated to hold three separate drinking fountains that produce filtered water, creating a more sanitary hydration experience. The Summerhouse was the brainchild of Frederick Law Olmsted, landscape architect extraordinaire and designer of the Capitol grounds. Begun in 1879 and finished in late 1880 or early 1881, the Summerhouse was meant to have a twin on the House (south) side of the West Front, but the second installation was never started because of protestations from Congress. Olmsted himself had concerns about the structure: he did not want it to intrude onto the Capitol’s landscape, “but he was also careful to ensure that it was sufficiently public to prevent its use for improper purposes,” according to accounts on the AOC website. Have you ever been in the Summerhouse or have you, like so many others, simply walked past it without ever taking the time to peek inside? Do you have other questions about the Capitol grounds? Be sure to let us know! Trumbull’s “Declaration of Independence”: Fact or Fiction? The Rotunda is home to many priceless works of art, one of which is John Trumbull’s “Declaration of Independence.” It is easily one of the most recognizable works of American art, featured prominently in history books, as well as on the back of the two dollar bill. Trumbull elegantly portrays a collection of our favorite founding fathers on July 4, 1776, focusing on John Adams, Thomas Jefferson, and Benjamin Franklin presenting the just-penned Declaration of Independence to John Hancock, who is poised to put his “John Hancock” on the document. What many people do not realize, however, is that this painting is a complete inaccuracy, depicting a scene that never occurred. The members of the Second Continental Congress voted for independence on July 2, 1776—the day John Adams believed would “be the most memorable Epocha, in the History of America…”and would “…be celebrated, by succeeding Generations, as the great anniversary Festival” (“The Book of Abigail and John: Selected Letters of the Adams Family, 1762-1784”, Harvard University Press, 1975, 142). The Declaration itself was finalized on July 4, 1776, and this is the scene Trumbull is showing us here. However, John Hancock did not sign the document until August 2, and signing would continue until January 1777 when the authenticated printed copy was first released. The final signatory’s name, Thomas McKean of Delaware, did not appear on this print, and it is possible he signed as late as 1781. So the question remains: what would compel Trumbull to leave us with a contrived historical scene? The common belief is that it was never his intention to depict the scene as it exactly happened, but instead to preserve the document itself and its hallowed place in our nation’s history. To capture the whole essence of the Declaration of Independence, its hopes and promises for our then-fledgling nation, and the men who wrote and signed it, signaling an end to England’s colonial rule over us. It is also important to note that Trumbull did not name the painting, “Signing of the Declaration of Independence,” but instead simply “Declaration of Independence,” essentially acknowledging to all his intention to preserve the importance of the document, not the moment of the signing itself. 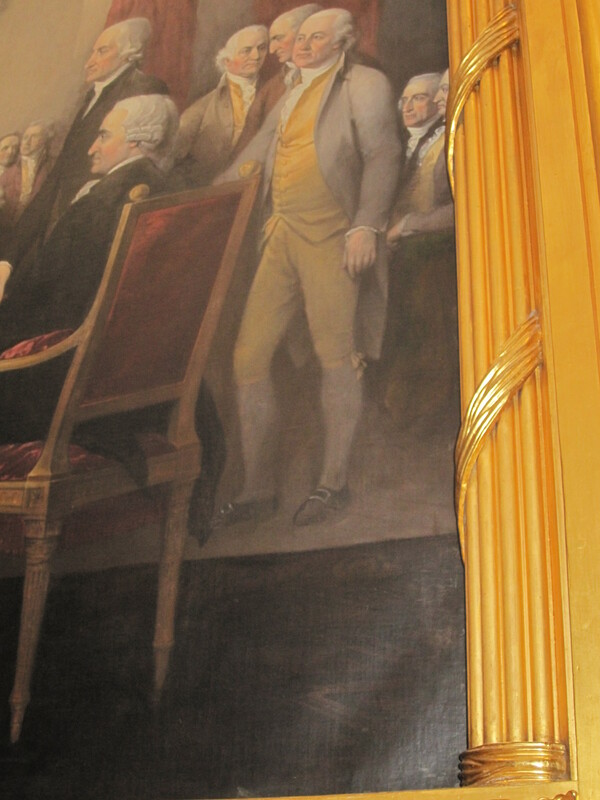 So if you are ever on a tour of the Capitol and you hear the guide, or anyone for that matter, erroneously tell you that Trumbull’s depiction is an accurate representation of the famous scene, now you know that that is simply not the case and can kindly correct them. 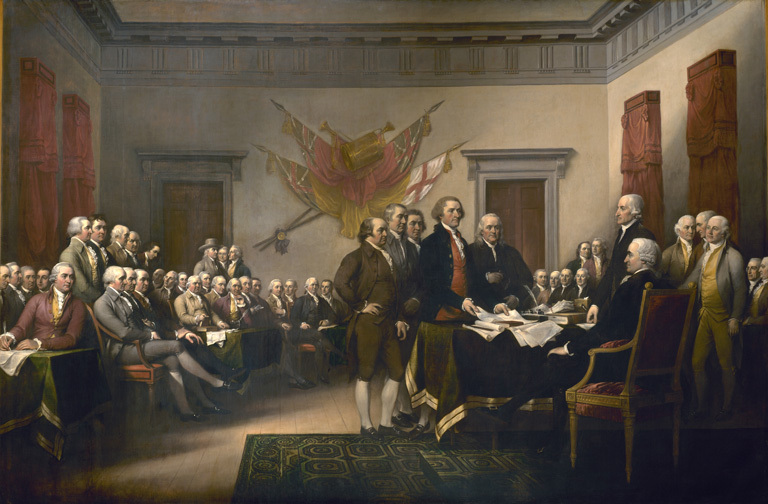 While Trumbull’s intentions in painting this scene cannot be totally known to us, it seems relatively clear that he was aiming not at complete historical accuracy, but instead for preserving the American ideal as represented by the Declaration of Independence. But is that not what history often is for many? A means by which to preserve the most idealized version of ourselves within our collective memories? Perhaps, but as much as history is often subject to the interpretations of many, when those interpretations lead not to idealistic preservations of the past, as in this case with Trumbull’s painting, but rather to unrealistic perversions of it, then we are entering murky and dangerous territory. There are historical interpretations and artistic liberties, and then there are lies and half-truths; too often the differences can be so subtle that sometimes most people won’t even notice, which can carry it with it rather severe consequences. Does Trumbull’s picture fall into that latter category? We don’t think so. Has it been our interpretation of his work that has been off the mark all of these years? Yes and no, it would seem; however, we are of the belief that whether it is a historical painting or a book about a historical event or person, interpretation is inevitable, but it is always a worthwhile endeavor to keep asking questions and keep the discussion open to make sure that, over time, more and more of the “truth” will come out. I remember my first tour of the Capitol: I felt overwhelmed at the hugeness of the building, the depth of the history, and the beauty of the Rotunda and other rooms. It wasn’t until months into this job that others—with keener eyes than mine—began pointing out to me the deliberateness of the details in the Capitol and the ways they enhance the very meaning of the building. Symbolism is everywhere in Washington, especially in the Capitol. Architects over the decades heard the opinions of hundreds of Congressmen and Senators while they were building, so few things were created without a distinct purpose. So when I was asked if the symbol of an axe and reeds next to the Speaker’s rostrum in the House of Representatives had meaning, I knew the answer was “yes” and did some digging to find out why. This ancient emblem called a fasces served as the symbol of civil authority in the Roman Republic. Originally it was an axe bound among a collection of rods held together with a red strap. 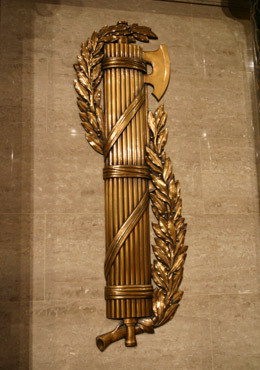 The fasces could be presented to restore order or to carry out punishment. Our founding fathers found deep inspiration for our own democratic experiment from the Romans and adopted the symbol to represent Congress. 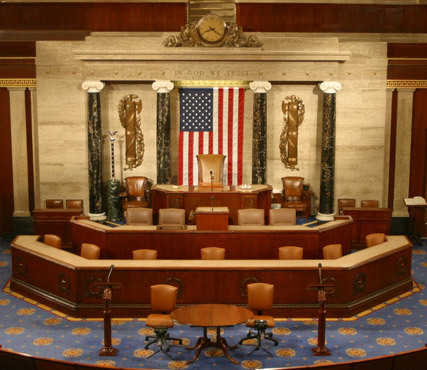 Just as the thin rods of the fasces become stronger when bound together, so the states find stability and strength while working collectively in the House and Senate in the Capitol building. 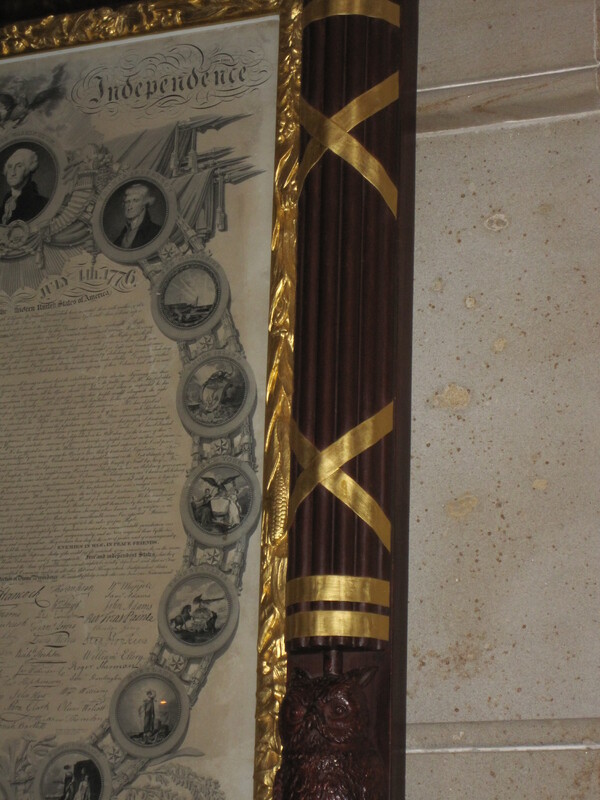 Charles Bulfinch designed picture frames with fasces for paintings in the Rotunda. 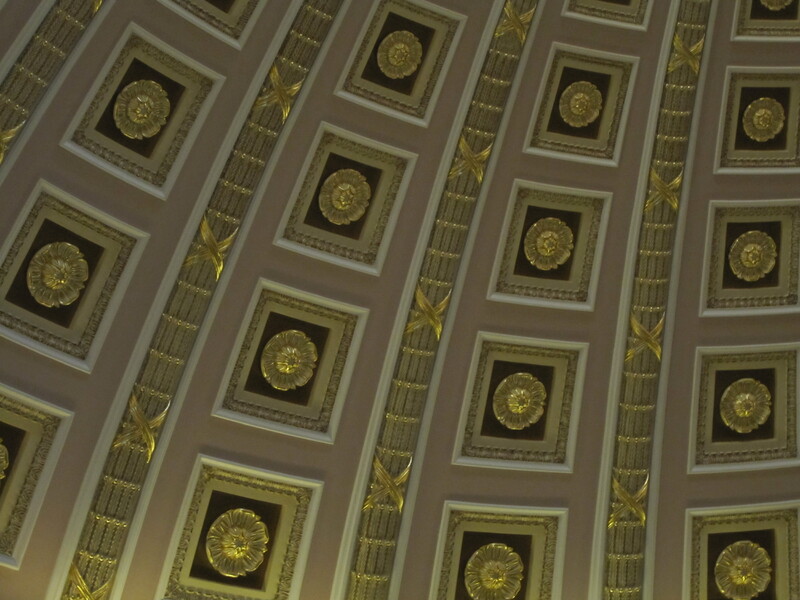 The ceiling decorations in Statuary Hall feature fasces. Statuary Hall was originally built as the House Chamber. This ancient symbol takes us from the Roman Republic and the ideas that formed the foundation of our American governmental system to the daily struggle for compromise and unity that is played out inside the U.S. Capitol building. It’s a small detail with big meaning. Where else might you have seen this symbol from antiquity? Have you ever passed by the same building or scene so many times and failed to see details lost in plain sight? Stop and have a deeper look today! You never know what you might discover. Capitol Tour 101: Visitors, take heed! The Capitol is home to countless pieces of priceless art, which can make it challenging to catch all the details in a quick one-hour-or-so visit to the building. Especially in the Rotunda, where many of the most famous paintings can be seen, it is easy to miss some of the components that make each piece incredibly important, both as beautiful works of art and as visual historical texts. Well, wake up, class, because this will be on the final! 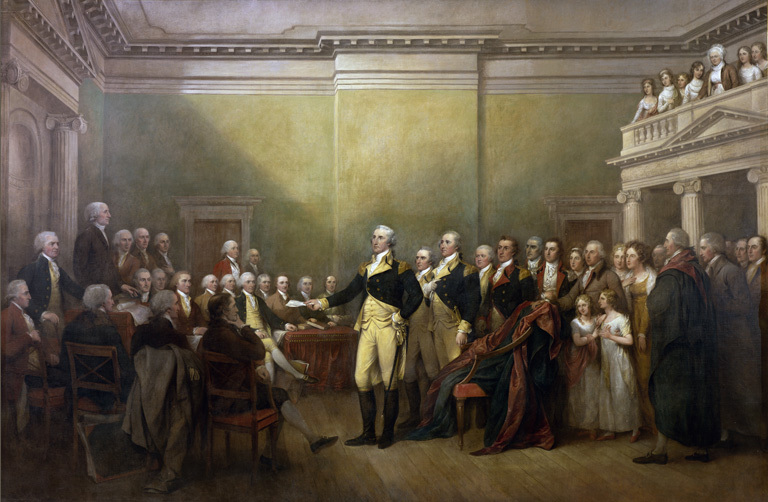 One oddity found in the art of the Rotunda is in John Trumbull’s depiction of General George Washington Resigning His Commission. Take a second look at the crowd surrounding Washington as he hands his power back to the hands of the people he fought to free from tyranny. Right in the middle of this group of gentlemen are two young girls. Who are these figures? They are Catherine, known as Kitty, and Mary Carroll, daughters of Charles Carroll. To this day, historians have been unable to find definitive proof of Kitty and Mary’s presence at the event, leaving their appearance in this scene suspect. To make matters more confusing, there are other women—and children, for that matter—featured in the painting, but they are standing in their normal place in the visitors’ gallery. A look at who Charles Carroll was may help shed some light on this mystery. Charles Carroll, a Catholic who was initially banned from voting because of his faith, was a very successful planter from Maryland—one of the wealthiest men in the colonies—and therefore was eventually able to overcome many of the social and political restrictions placed on Catholics. Carroll was a staunch advocate of independence for Maryland, and as his call for freedom spread throughout the colony his prominence in the community grew. He was selected as a member of the Annapolis Convention in 1774, and would later sign the Declaration of Independence and serve as a member of the United States Senate representing Maryland. He was the only Catholic to sign the Declaration of Independence and the longest living—and latest surviving—signer of the document. Carroll’s prestige and fame are apparent and well-deserved, but the question still remains: why were his daughters, who may or may not have been present at the resignation of Washington’s commission, painted right in the middle of the historic scene? One suggestion is that Trumbull added the Carroll daughters to the work in order to please the illustrious and powerful Charles Carroll. Carroll may have requested that the painter add his family into the painting alongside him. Or Trumbull may have chosen to add them in to make the scene more interesting to viewers, breaking up the monotony of knee pants and soldiers’ uniforms worn by the surrounding men. History, however, has neglected to hand us an exact reason as to why Charles Carroll’s family is depicted with him in the painting, in the midst of the action. Have a guess about Trumball’s choice to include Kitty and Mary in this painting? Let us know in the comments. And if you have any questions about art, architecture, rooms, or people encountered in the Capitol, let us know. We’re planning a series of posts about oddities, surprises, little known facts, frequently asked questions, and myths to be busted. Look for the category “Questions about the Capitol” to find future entries.